BOOT: FULL GRAIN LEATHER UPPER. 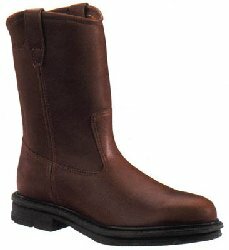 WOLVERINE FUSION COMFORT CONSTRUCTION WITH WOLVERINE DURASHOCKS TECHNOLOGY. 360º STITCH WELT CONSTRUCTION. REMOVABLE FULL CUSHION DUAL-DENSITY POLYMER INSOLE. UNLINED. FIBERGLASS SHANK.